The day has been an interesting day in the life of a pioneer – because it has been quite traditional rather than pioneering. My day started with me presiding at the 10.30 Eucharist in the cathedral. Two things still massively hit me about doing this. First I am always amazed at how great a privilege it is to be able to lead people in worship in this way. presiding at the Eucharist in such a special place on behalf of some quite special people is quite an honour. Today I made a few errors but the congregation are very forgiving but that did not distract me from how special this is, and I still can’t help but be close to tears or have a silly grin at different parts of the liturgy. The second thing that still surprises me is how nervous I still get at singing the 3 lines of the Eucharistic prayer. I have got over the embarrassment of singing publicly, but I am still incredibly nervous and spend ages in the car before the service singing the lines over and over again. Today I did not think I was coping very well with th singing but an encouraging smile from one of the younger members of the congregation helped! After this I traveled to another church in the diocese to take a baptism – this was the first I have ever done (well that is if we exclude the doll I baptised in Sarah’s Year R class soon after my ordination!) At first I weas nervous about doing this – not because of the service itself but because this wsa a baptism at 1.00pm, and so being outside the main church service. It is difficult to welcome the child into the family of the church when the rest of the family are not there. It was, however, an honour to be able to support this family in this way. The family would not call themseleves church goers but when we were chatting last week we got on to talking about why they wanted their child baptised. The mum immediately said words like ‘something inside me tells me it is the right thing to do – we never even had to think about it, it just seemed natural!’ I believe that ‘something inside me’ is the Spirit of God and as we baptise we have to trust that God is working in these situations. Following the baptism I moved back to the cathedral for Choral Evensong as it was my turn to read one of the readings and lead the prayers. Another fairly traditional service. Today, however, I was struck by the number of people that were present and the ya they seemed to be ‘engaged fully’ with all that was going on. 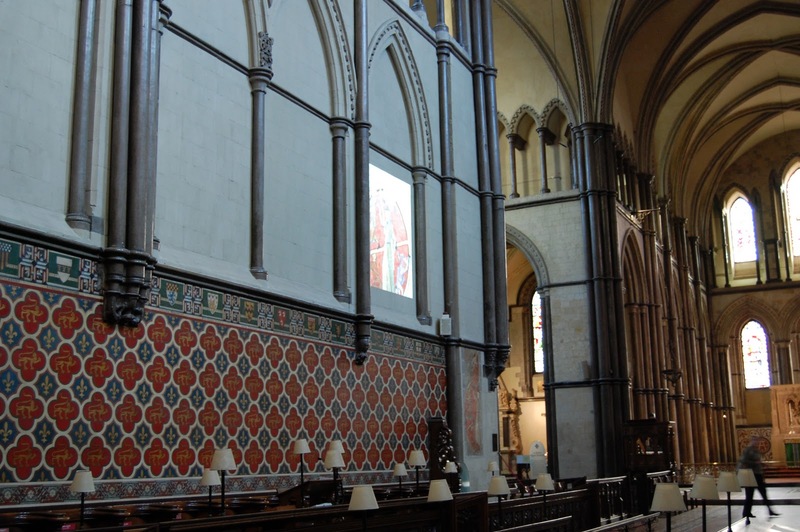 I’m not sure what I make of Evensong – often the thought of it does not appeal to me, but when I am there it is pretty obvious that God is powerfully present through the music and liturgy. When I attend I enjoy this old service and find something quite mystical in the language that is intriguing. I am home after what is pretty much a pretty traditional day – but a day where as a pioneer I have been challenged and given food for thought.